The markets opened marginally lower today amid weak cues from global markets. 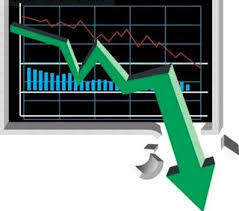 After a few minutes of trading the markets turned volatile and slipped into the negative territory. The early sell off witnessed among the Metal, Consumer Durables, Power, Realty and Capital Goods stocks. However, IT stocks are witnessing some buying interest in the early trade. Both the BSE Mid Cap and the Small index are trading with a cut of more than 1.5% each. The BSE Sensex is now trading below the 14500 mark and the NSE Nifty below the 4350 mark. The BSE Sensex is trading down by 49.88 points or (0.34%) at 14,472.96 and the NSE Nifty is trading lower by 28.40 points or (0.65%) at 4,327.75. The BSE Mid Cap decreased by 60.75 points or (1.21%) to 4,960.32 and the BSE Small Cap fell by 97.17 points or (1.68%) to 5,689.37. The Overall market breadth is negative as 394 stocks are advancing while 1251 stocks are declining and the 37 stocks remained unchanged on BSE.